Solar Hot Water … also known as Solar Water Heating (SWH) is a technology that every home or business owner can use to save on utility bills. In a year, the average household of four will consume enough energy heating water to fuel an intermediate-sized car for 20,000 miles. Many Solar Domestic Hot Water (SDHW) systems were installed at the turn of the century (early 1900′s) in Southern California before natural gas became predominant. After much trial and error over the past twenty-five years, modern systems have become not only efficient and cost effective, but also extremely reliable. Q. What is a solar water heater? A. A solar water heater uses the sun’s energy to pre-heat household water before it enters the conventional gas (or electric) water heater. Because of the tremendous amount of sun that Southern California receives, a solar water heater could generate up to 90% of your annual water heating needs. A. Water heated by the sun can reach temperatures exceeding 212º F, but the normal temperature for household use is only 120º to 130º F.
Q. Are there different kinds of solar water heaters? A. 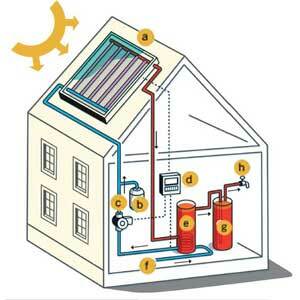 Solar water heaters are divided into two kinds of systems: active or passive. Active solar systems rely upon moving mechanical parts in order to transport heat, while passive units simply use the sun to accomplish this action. The bulk of systems installed in Southern California are active because they are considered to be more efficient and attractive. However, most of the systems installed worldwide are passive because they are simple and need no auxiliary power (electricity) to operate. Q. How do active solar collectors work? A. The collector is usually an all copper tube and fin absorber enclosed with an insulated aluminum frame or “box”, covered with a low-iron tempered glass glazing. The water contained within the gas or electric water heater is circulated through the solar panels in a single-tank system, or a separate tank is used to pre-heat the water before it enters the conventional water heater in a two-tank system. A two tank system is usually considered to be the best option but if properly managed, a single tank system can provide between 50 and 80% of the household needs for hot water. The water being circulated is gradually heated and the system should be sized to provide between fifteen to twenty-five gallons of hot water per person per day. A reliable automatic control to operate the pump is essential. Fortunately, pumps and electronic controls have evolved and can be expected to provide over twenty years (and counting!) of service. Q. How do passive solar collectors work? A. Passive systems can be divided into two types: Thermosiphon and Integral Collectors Storage (ICS). Passive solar systems are popular because of their inherent simplicity and reliability. The storage tank is located on the roof and heating effect of the sun causes warm water to circulate within it. Cold water from the city flows directly to the tank on the roof, and then flows to a conventional water heater located on the ground level. It is desirable to keep the distance between the solar system and ground level water heater as short as possible in order to reduce the amount of cold water sitting in the pipe between the two units. In the case of a thermosiphon system, an insulated tank will prevent the loss of stored heat during the night. The ICS or “batch” heater is the most simple kind of solar heater, but the exposure of the storage unit to night air can cause significant heat loss in winter and precludes the use of this kind of panel in all but the mildest climates. Q. Will solar heating affect how much water I will have? Will I have to change my bathing and cleaning routine? A. Yes and No. You will actually have much more hot water than ever before. If the system is sized well for your family, you will no longer need to wait for the water heater to ‘recharge’ between showers. Q. Will the solar system affect my existing water heater? A. Yes. Since the water heater will operate far less frequently, solar will extend its life significantly. Some water heaters that were retrofitted with solar in 1974 are still in service today, over a quarter of a century later. The life of an ordinary gas heater without solar is between five and ten years. Q. How much does a solar water heater cost? A. It depends upon the size of the system and the needs of your family and the way you currently heat your water. The average annual cost for water heating can be over half the expense of a household’s entire annual gas bill, especially in those homes with teenagers or shower hogs. In an average home a person uses between fifteen and twenty-five gallons of hot water a day, which can cost $5.00 to $25.00 per person every month. A family of four could be spending between $384 to $1200 a year just for heating water. A utility bill is sometimes structured to charge for energy at varying rates or tiers, where the most costly level or tier is levied in winter, when you are using the most gas. A solar system can reduce your daily gas consumption and thus you would be purchasing the less expensive Tier 1 or “Lifeline” rates. This chopping off or shaving of the highest can have a profound affect on the cost of winter utility expense. Q. Are there any public incentives available to reduce the cost of a solar water heater? A. Yes. There is a federal tax credit available to help lower the final cost. It is 30% of the cost and is scheduled to expire in 2016. If the water heating system is used in a business then there are also accelerated depreciation (MACRS) which will offset the financial impact of an installation. Currently, the system must be rated by the SRCC to qualify for these Federal tax benefits. The State of California also offers a rebate to residential and commercial property owners who install solar water heaters. Residential customers can receive up to $1,875 in rebates, while multifamily home and commercial customers can receive up to $500,000. Q. How long does it take for a solar heater to pay for itself? A. Solar heating does have a payback, and it can vary from four to ten years. But it may be more useful to think of solar as an investment that yields an annual return, much as a bank savings account provides interest. A solar water heater will generate savings that can equal a bank account generating a twenty percent (20%) annual return, and the savings are not taxed as income, as is the interest you earn at the bank. The truth is, if you want hot water… you will be paying for that heat. You may prefer to pay the utility bill forever, or you may wish instead to go solar, and become your own utility. It is quite similar to the reason you once decided to buy your home and stop renting. Solar is simply the best investment available today because it guarantees a return on money that you will otherwise “burn” and helps you develop equity as you bank your savings.